During the Annual General Membership Meeting last Friday, 16 June 2017, members of the academic and private sector had a discussion on Tax Reform for Sustained and Inclusive Growth. 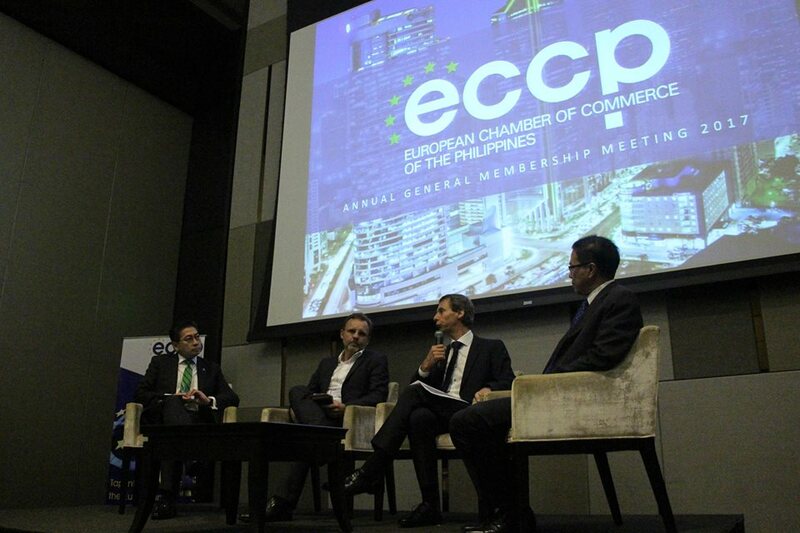 Below are the highlights of the discussion which was kicked off by former UP School of Economics Dean Mr. Ramon Clarete, who delivered a presentation on the tax reform, followed by a panel discussion with Mr. Walter Van Hattum, Head of Economic and Trade Section of the EU Delegation to the Philippines, Mr. Jacques Reber, Nestle Philippines CEO, and moderated by Mr. Tony Abad. Former UP School of Economics Dean Dr. Ramon Clarete delivered a presentation focusing on the rationale and salient features of the Tax Reform for Acceleration and Inclusion (HB 5636). A copy of the presentation can be accessed here. Walter Van Hattum, EU Delegation Manila Head of Economic and Trade Section, cited various factors affecting the competitiveness of the country as an investment destination, and reiterated the need for foreign participation in economic activities; foreign participation in government procurement of goods and services; recognition and protection of intellectual property rights, apart from the comprehensive tax reform. it was also mentioned that such a measure will negatively impact the European automobile manufacturers which are currently already at a disadvantage to the Japanese and Koreans. Emphasizing the implications on trade, the EU-PH FTA becomes even more crucial in facilitating the elimination of import tariffs for EU automotive vehicles in the Philippines. Jacques Reber, Nestle Philippines Chairman and Chief Executive Officer, mentioned imposing tax on sugar-sweetened beverages may not necessarily achieve its targets of eradicating obesity and increasing government revenue collection. On the contrary, such measure is anticipated to increase the prices of various commodities, and will significantly affect the poor and poorest segment. Moreover, this move is also believed to hinder economic growth, resulting in reduced government revenues, economic contraction and job losses. It was stressed that obesity is a complex issue which is caused by many other factor aside from excessive consumption of sugar, and should be addressed with a whole of society approach.